Greg was about five years old when Paul Simon released his Graceland album. I have wonderful memories of the two of us singing along all the way to daycare, Greg’s little blonde head bobbing in time to the music. 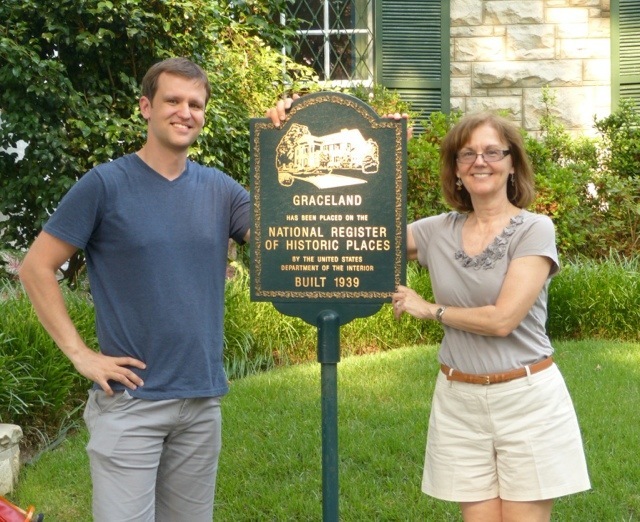 I never thought that decades later, we’d be visiting Graceland together! Elvis purchased Graceland when he was 22, and for the time, it was quite a mansion, but not so much by today’s standards. 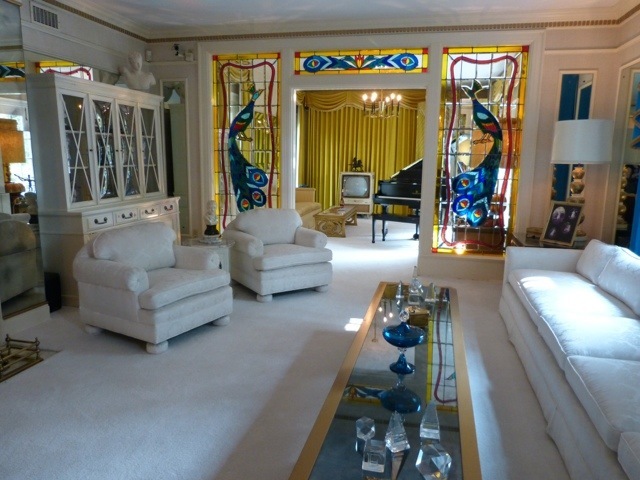 According to the audio guide, this is the way the living room looked when he lived there. Growing up, I wasn’t a big Elvis fan, but over time, I’ve come to appreciate how much he contributed to popular music. 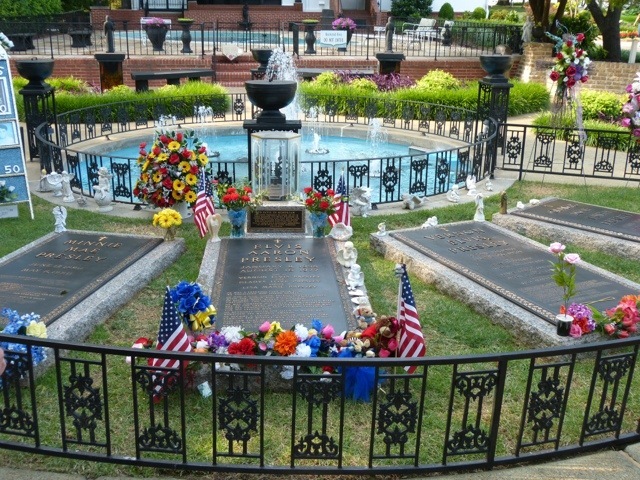 His achievements are impressive, and the Graceland tour does an effective job highlighting them. 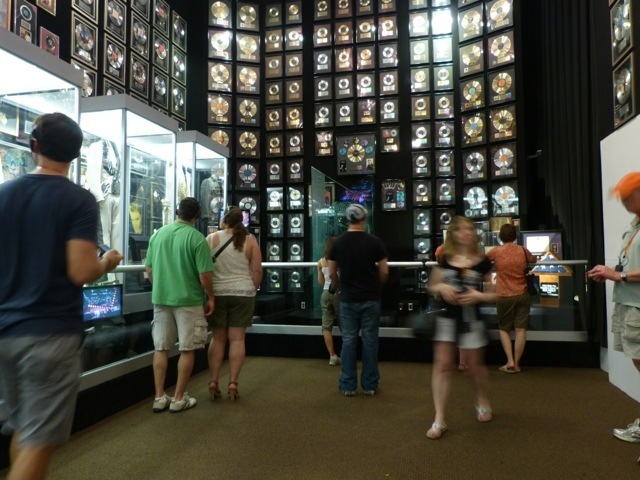 Elvis’ racquetball court is now a display room for his hit records. Pretty impressive, when you see them all amassed in one place. How sad that his life ended the way it did. Are there many music superstars that have been able to manage their celebrity? I’m thinking of Michael Jackson, Whitney Houston, Jimi Hendrix, Janis Joplin, the list goes on and on. The Graceland complex is a marketing machine. We bought the “platinum” tour, (but found a half price ticket on the Internet) which got us into the car museum, the planes, and a couple of rooms with videos of Elvis on tour. 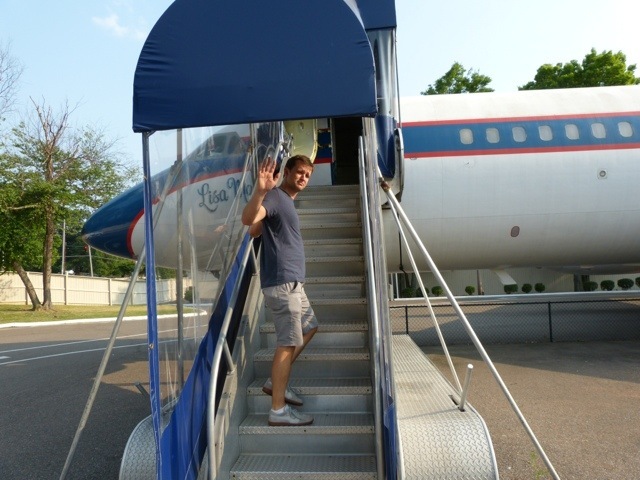 Here’s Greg, doing his Elvis imitation, as he climbs into the Lisa Marie, an early jet, that was customized with a bedroom, living room and conference table. Ah, those most definitely were friendly skies! Other than the mansion itself, every site is accessed through a gift shop containing every item imaginable with Elvis’ name or picture slapped onto it: pajama tops and bottoms, trivets, key chains, sunglasses. It is a money machine…and I’m sure, very good for the city of Memphis, providing jobs for lots of its citizens. One of the things that I loved most about my former job was my wonderful customers. I traveled to Memphis at least twice a year for the past 10 years, visiting International Paper. We would conduct our meeting then enjoy a fantastic dinner together. Let me tell you, Memphis has some of the best restaurants in the United States! This time, I had no business responsibilities, but was fortunate enough to spend time with Jim, who graciously took us to lunch and gave us a tour of places I hadn’t discovered on prior visits. The highlight was his partner’s studio. Brantley has done some amazing pieces, one of which is hanging in the Memphis Civil Rights Museum. Enough for this post…but more on Memphis to follow. Looks like you were the only tourists.